A group of European monitors detained by pro-Russia insurgents in eastern Ukraine appeared in public Sunday to give assurances they are not being mistreated, even as negotiations began to secure their release. With armed rebels watching as they spoke, the leader of the monitors from the Organization for Security and Cooperation in Europe, German Colonel Axel Schneider, assured reporters in Slovyansk, eastern Ukraine, they were in good health. Schneider said they were being held for political reasons. 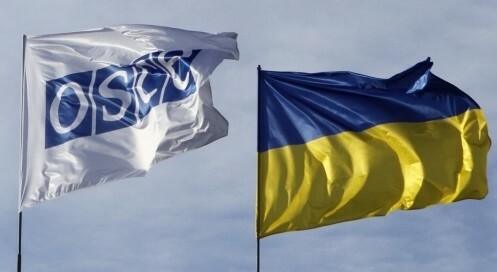 The OSCE sent a team of negotiators to eastern Ukraine to meet with the self-proclaimed pro -Russian mayor of Slovyansk, Vyacheslav Ponomaryov, about freeing the military monitors, and one Swedish observer was released. Ponomaryov’s militants also showed off three bloodied and blindfolded officers from Ukraine’s Security Service they captured. The officers were shown with heads bowed, and stripped of their pants and shoes. In Donetsk, armed fighters seized the regional television headquarters and ordered it to start broadcasting a Russian state channel. Kyiv authorities had ordered a halt to programming produced in Russia saying it was being used for propaganda purposes. Meanwhile, at a news conference in Malaysia, U.S. President Barack Obama warned economic sanctions against Russia will be stiffened because he said Moscow is encouraging unrest in the largely Russian-speaking parts of eastern Ukraine. “There is strong evidence that they have been encouraging the kinds of activities that are taking place in eastern and southern Ukraine and so, collectively, us and the Europeans have said that so long as Russia continues down the path of provocation rather than try to resolve this issue peacefully and de-escalating, there are going to be consequences. And those consequences will continue to grow,” said Obama. In Washington, a national security official said new sanctions this week will target Russia’s defense industry and companies with close links to Russian President Vladimir Putin. In a joint statement late Friday, the Group of Seven major economies announced it had agreed to “move swiftly” on new sanctions against Russia because of its interference in Ukraine. Obama says the United States and Europe must act together in levying sanctions against Russia over its actions in Ukraine that he says threaten that country’s independence and sovereignty. Armed pro-Russian gunmen have seized government facilities in about 10 cities and towns in eastern and southern Ukraine, and are demanding referendums on seceding from Ukraine and joining Russia. Kyiv says and the West agrees that the operation has been planned and is being spearheaded by Russian special forces with the aim of destabilizing Ukraine so as to stifle its European aspirations.